Blue Mind Health Documentary teaches you how having a Red Mind can impair your physical and mental health and the benefits of attaining a Blue Mind. What is the Blue Mind Health Documentary? Have you ever noticed how you always feel calmer and more relaxed when you’re around water? People who live in coastal regions seem far more relaxed than those who live inland. There’s a scientific basis for this, known as “Blue Mind Health”. When you spend too much time away from water, it leads to “Red Mind”, which in turn leads to health problems. Learn more about Blue Mind and what it all means for your health with the Blue Mind Health Documentary. The Blue Mind Health documentary is a six part online series that looks into Blue Mind and Red Mind, how to shift to a Blue Mind, and what the benefits of doing that are. Red Mind is when your body is stressed to the point of going haywire. All sorts of worries, anxieties, and pains contribute to Red Mind and exacerbate the issue. These tiny stresses get your stress hormones firing on all cylinders and leave you feeling depressed and can contribute to chronic conditions. Even a small amount of stress can damage your body for several hours. 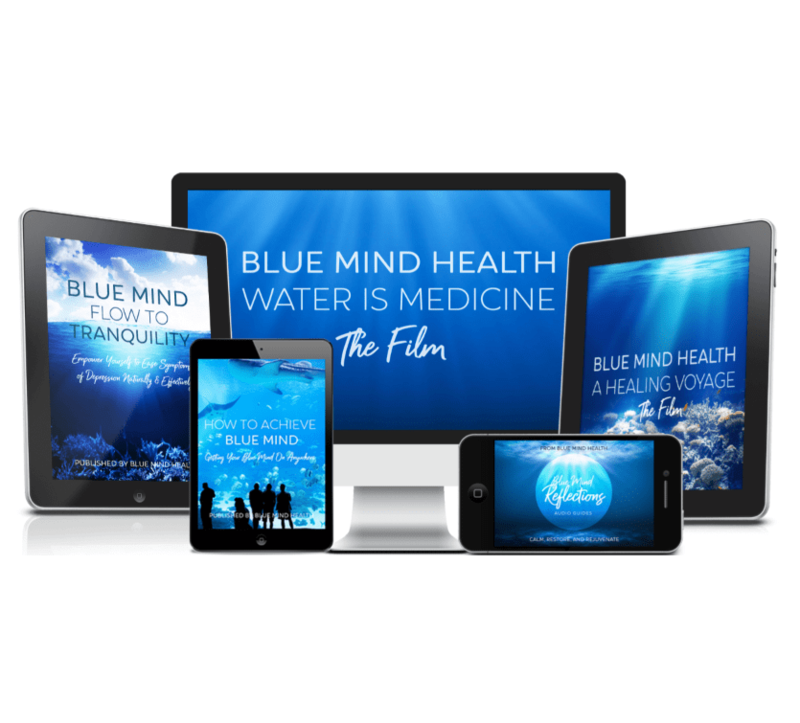 Blue Mind Health documentary teaches you about how water is medicine and how to use it to treat your Red Mind and become healthy. Find out more about Blue Mind Health and how to use it to heal and cope with the stresses of our modern lives. Learn more about the connection between humans and “wild” and “small” water. You’ll learn the “power of awe” when ti comes to physical, mental, and emotional health. Awe has been addressed throughout history by great writers and scientists such as Einstein. This episode looks at how awe can be used to create a positive impact on health and well-being. How to achieve “awe” to stimulate curiosity, boost immunity, stimulate creativity, improve social connections, and more. You’ll meet Special Operations combat veterans who used the sea to heal themselves, including US and British marines and navy SEALs. Discover how these men and women have dedicated themselves to marine restoration and preservation with the help of marine scientists and conservationists. Listen to their heartwarming stories of how they used Blue Mind Health and the ocean to overcome their physical, emotional, and mental pain – including PTSD. Learn more about how water can ease the psychological symptoms of abuse and trauma. Learn how to better empower yourself and live in the present even as your mind tries to pull you back into the past. Learn how water can help in recovery from physical injury and ease the isolation that comes with being injured. Learn how to tap into the power to create, experience, and overcome life’s challenges with a powerful connection to water. Discover how water triggers the senses and expands your body, mind, and spirit to build a great life. How to improve your relationships with the love and connection of water. Discover more about how Blue Mind is the most natural, ideal state to be in. The Blue Mind Health documentary looks at the phenomenon of Blue Mind and Red Mind; how having a Red Mind can impair your physical and mental health and the benefits of attaining a Blue Mind. Learn about our connection to water and how to make the most of it with Blue Mind Health.